My hair texture/curl pattern revealed!!! | .forever.as.i.am. You can see just how many different textures I’m working with as well, I have my natural texture then it goes down to the slightly looser texlaxed portion. (Texlaxing is mixing a conditioner with a relaxer and purposely under-processing the hair to retain some of the curl pattern.) And finally my bone straight relaxed ends. Unfortunately I experience a crap-ton of breakage with all three of these textures so I try to protective style as much as possible and minimize my use of heat. The areas where the textures begin to change are the most fragile and susceptible to breakage so I have to be very careful when finger detangling. My bone straight relaxed ends are the worst -___- They tangle like nobody’s business. And with all this I know some may be thinking, why not just big chop? and the answer to that is simply, I’m a wuss. I don’t think I could handle myself with short hair, all my life I’ve had apl-bsl length hair and anything above that just scares me. Its been almost one year since I’ve started my hair journey (1 year on may 12, 2013) and I have just about 6inches of natural texture and the rest around 10inches (I’m guestimating forgive me) texlaxed and relaxed that I am just not ready to cut off, maybe in another year I’ll be ready for that BIG CHOP. 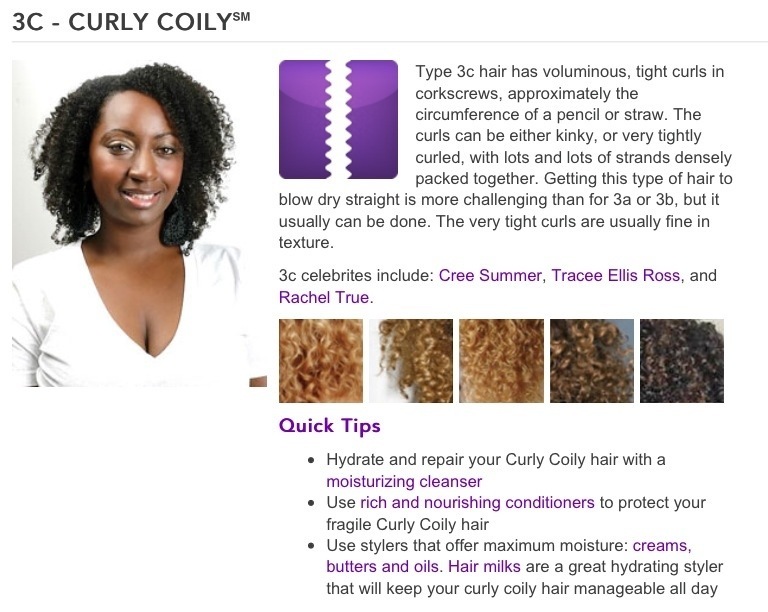 I found out what my texture was from naturallycurly.com they have a great source of information on hair types and pictures unlike some other hair typing systems. I find this one to be the most reliable over andre walkers h.t. system. Find out whats your hair type here. hi!! Im a 13 year old transitioner and my texture is JUST like yours! I really love this blog and im gonna be up here during my natural joruney because i really coulnt find any transitioners going trough what i am….But u are perfect :P…And im probably gonna be posting alot because my family doesn’t support my journey 😐 but thank you for making a wbsite!!! Ps. OHMYGAWHHH big props to you for starting at such a young age, this is the perfect time for you to start developing and mastering healthy hair habits. I wiiiiiiisshhhhhhhhh I would have started my hair journey at 13! If you stick with it Woooo by the time you’re 18, your hair is going to be sooooooo long and crazy healthy x.x lol so I hope you’re in it for the long run! What texture would you say the texlaxed is? My hair is very simillar to that. Sorry for such a late reply as I am in the midst of moving, I’d say my relaxed parts were around 3b/c-ish but I can’t really say since it’s not really a “natural texture” I hope that made sense.